So much yarn, so little time. : Graffiti - I love it! It's St George's Day today, patron saint of England, so it seems right to blog about our glorious countryside. At the beginning of my walk I came an unexpected find on a barn wall in a Kent orchard. Mine's a pint! I rather like graffiti when it's more than just a scrawled tag. 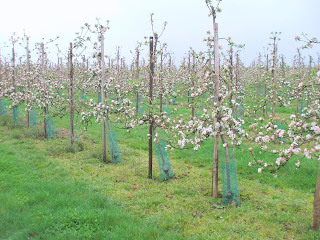 The orchard itself is just starting to come into blossom, I love the way the flowers are deep pink as buds, and soften to a pale pink as they open. yup, sorry - I should be clearer. 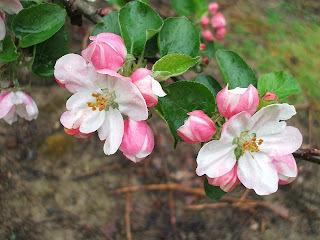 Kent is known for its apple orchards, or at least it used to be. 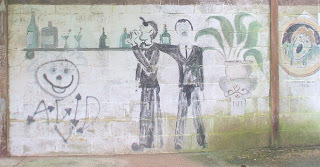 Brilliant graffiti, I wonder if the person who made it has developed their talent, those barflies are really characterful! The most touching graffiti I ever saw - and I now can't remember where but it may have been Glastonbury Tor - was really old, as in 18th century. The usual thing of couples carving their names but they'd put a date and you could tell from the script and the weathering it was genuinely old.